“Can we use the same building for three words?” one team asked. Standing on the front steps of Crown Hall they held up their vocabulary cards: “Symmetry,” “Facade,” and “Starchitecture.” The game rules were fuzzy, so they they decided on starchitect for the building, facade for the north face, and symmetry for the handrails. Another team made an observation. “Suburbs,” they said, holding up a game card, “do not exist on campus!” They opted for extra credit, and added “Accessibility” from another team’s list, after observing that the crosswalk lights also beep and chirp so the visually impaired know when and where to cross the street. This is the start of the fourth week of our 6 week summer program: the teams are beginning their own “Wayfinding” design project, and they are learning a little more about the language of urban design. The team facilitators are using collaborative, multi-disciplinary activities – always hands on, often gamified – to rapidly expand the team’s toolbox of urban design skills. At the end of this week the teams will present their work and learn about careers in planning, design, construction, and development. The scavenger hunt is helping them build their vocabulary in preparation for the conversations and presentations they will be leading. 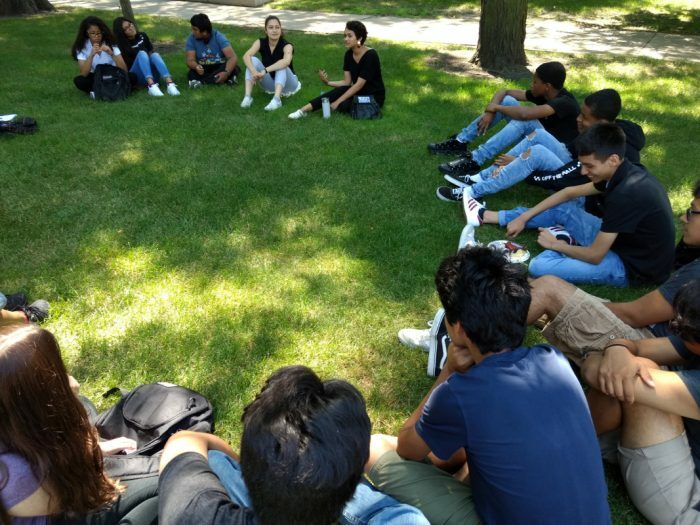 This year Territory is running two summer teams funded through Chicago workforce readiness programs After School Matters and One Summer Chicago. We are working with over 40 young people ages 14 to 19. The teams started one week apart, so we are able to quickly iterate our skill-building activities. With nearly instant feedback, we are rolling out new ideas, like the urban design scavenger hunt, and refining others, like our career days. After forty five minutes, the scavenger hunt teams meet back at Crown Hall for a short tour of the building and a conversation with Jess, a current student in the School of Architecture’s five year undergraduate program. Sitting in a circle under a shade tree, our team asks her questions like, “Which is your favorite year in the program so far?” and “Did your high school prepare you for architecture school?” With the help of Jess, and the gamification of urban design, these 14 and 15 year olds are starting to see themselves as college students and designers.